Random logic is the software behind the popular Casino-on-net and 888.com casino sites. It was started in 1997 by graduates of Israel technion, and today, it has a large number of casinos and free slots. Random logic offers myriad entertainment options, and has become increasingly popular over the years. It has been successful in garnering positive reviews and player satisfaction. Random Logic has licensed its casino suite to Cassava enterprises, which runs popular casinos such as Pacific poker site and Reef club casino. All of the Random Logic applications have to be downloaded, however, numerous applications can be downloaded in one go, and their site is extremely easy to navigate. Most Random Logic games are targeted towards middle and high rollers. What games are supported by Random Logic? Random logic offers numerous entertainment options covering a wide segment of players. At any Random Logic casino you will get access to at least 300 games each appealing to a certain group of players. The first impression that you get of a Random Logic casino is that they have impressive graphics and pleasant sounds. The overall impression is that of a premium casino. Random logic casino covers all major table games including craps, roulette, blackjack, Caribbean Poker, baccarat, and Pai Gow Poker. Random logic also offers 16 classic slots, 7 video poker games, and 4 video slots. They have no place for funny and creepy games as they target middle and premium segment of players. As far as roulette is concerned, roulette tables at Random logic casinos are single-zero wheels. You can play alone, or with a group, or you can reverse tables with other players. The betting is pretty easy with Random logic roulette, and the tables look pretty elegant. The slot floors at Random logic casinos include 16 classic reel spinners and 4 new video slots. Six of these reel spinners are progressive. These slots have a conservative feel, and you will get the same feeling as you get at your local American casino. Blackjack tables at Random logic remind you of premium Vegas casinos. The chips get neatly stacked on the blackjack table, and there is a highlight for the bets. What are the important features of Random logic? There is no Flash technology used in Random logic software, still, you are not required to download one game at a time. The site is very easy to navigate, and extremely player-friendly. The highest jackpot value at Random logic casinos is $1,000, 000. Random logic applications have impressive graphics, but there is nothing over-bearing about them. Even the sounds are pretty pleasant. The element of randomness is integrated into the software, and Random logic is certified fair by the auditors at e-Cogra. Random logic is extremely popular casino software. You get access to over 300 games at a Random logic casino. 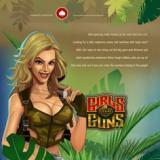 They target medium and premium end segment of casino players, and all games have pleasant graphics and sounds. They are certified fair by auditors at e-Cogra.